I haven't written a Discovering East Tennessee post in a long time. I meant to do one in March but never got around to it. 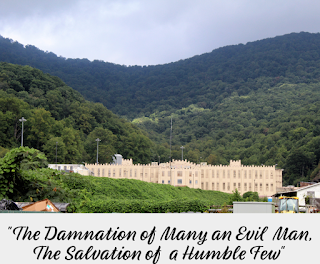 I will, eventually, but this post is about Brushy Mountain State Penitentiary. 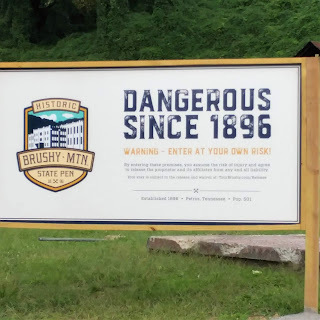 When I was growing up, those four words would send chills down my spine: Brushy Mountain State Penitentiary. It's called "The End of the Line" because it's where convicts were sent when other prisons couldn't handle them. They knew if they were sent there that there was no way out. It closed down in 2009 after 122 years of housing bad guys...the worst of the worst. The State of Tennessee sold the property to Morgan County. Developers had an idea; a way to bring revenue & jobs back to the county. This little community of Petros had many members who worked at the prison. Families had been employed there, kind of like a family business. When the State shut down the prison, the community definitely felt it. But now, new life is breathing into this facility. If you ask me, the plan is ingenious. Take a run-down, historical prison, fix it up, get a still going, and sell tours & moonshine. All in a beautiful setting. James Earl Ray (who was convicted of assassinating Martin Luther King, Jr.) did time at Brushy Mountain. He escaped in 1977 but was found 50-something hours later. I remember when that happened, and I remember being scared. The old maintenance building is now a gift shop and restaurant. We ate once we went in, although it was a little pricey for a sandwich and a side. I would recommend stopping in Oak Ridge or Oliver Springs for a quick bite before heading to Petros. There is a museum where you can watch a 20-minute movie about the prison. The tour is self-guided; however, there were 2 former prisoners and former guard on the grounds when we were there. 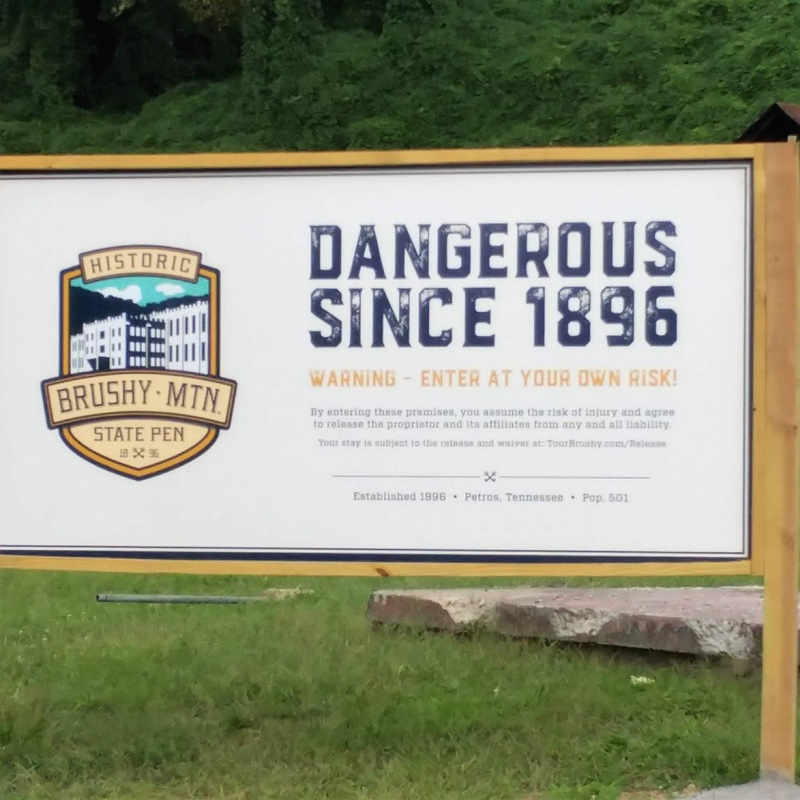 One of the former prisoners walked around with a group of visitors and told some stories of what it was like to be a prisoner at Brushy Mountain. 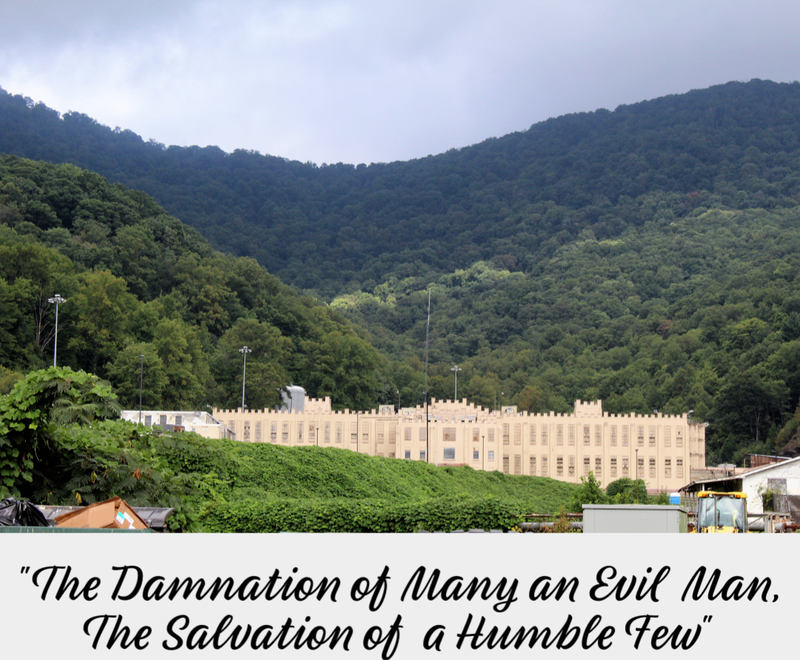 the salvation of a humble few." After walking to The Yard, we went back to the Courtyard and listened to the former guard talking to a few people. Someone asked him if he knew if something had happened in the prison, and he said that he only wanted to know what he needed to know, and that was it. Maximum security prison built within the prison. The whole prison was once all maximum security but in the years before its closing housed some prisoners who did not require maximum. The site has already held one concert, and there are plans for a campground. Paranormal tours are also available. At one time there was an electric chair on the premises but it was never used. It was sent to the state pen in Nashville. Even though, there were many prisoners who died at the hands of other prisoners (and guards) as well as disease (especially in the early years). I think the $12 it cost for admission was well worth it. We went on a Sunday, right when it opened for the day. As we were leaving, there was a good crowd. 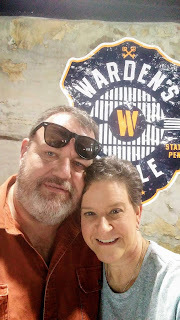 The history was fascinating, and having the former prisoners and guards hanging around was a definite plus. If you find yourself around the Oak Ridge area, it's definitely worth a visit to the "Alcatraz of the South". 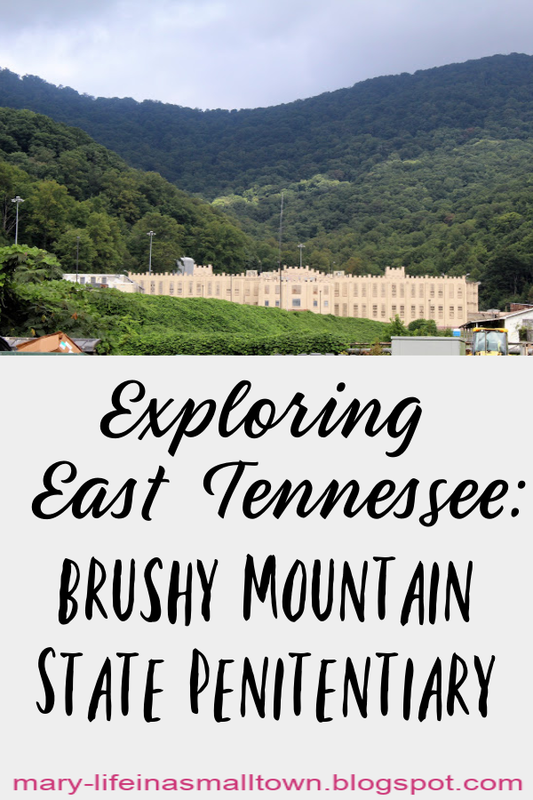 I love discovering East Tennessee, and Brushy Mountain State Penitentiary has always been a curiosity, but I certainly didn't want to visit while it was open as a penitentiary! 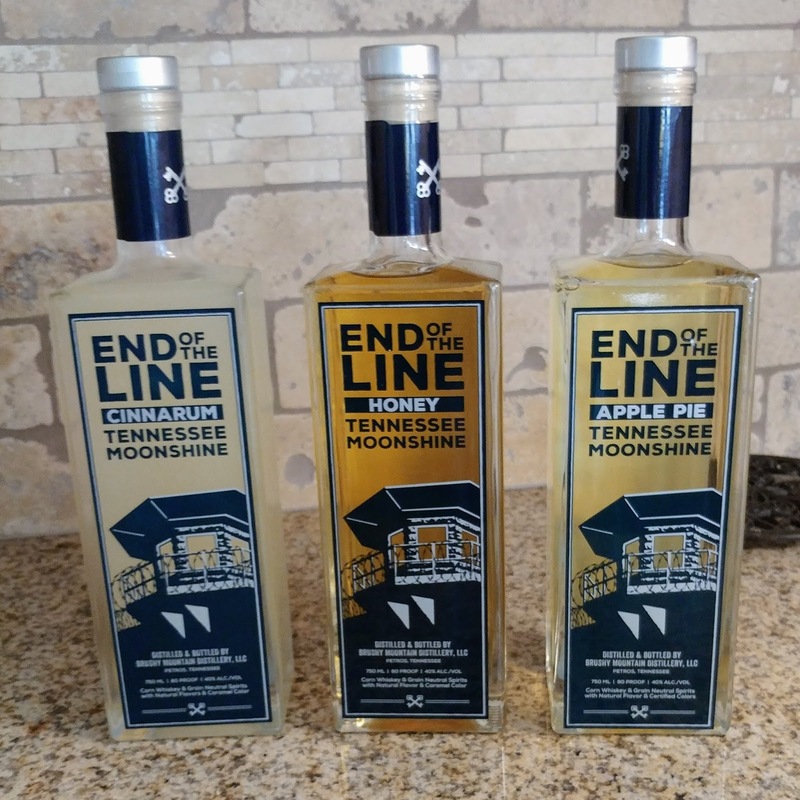 Stop at the Gift Shop for some samples of moonshine. There are 9 different flavors (including "regular"). 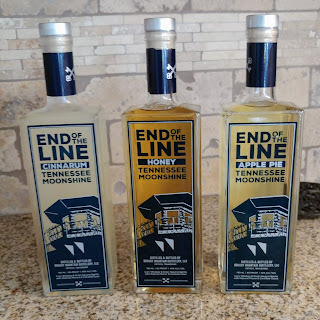 We were able to chat with the distiller for a couple of minutes...really nice guy! We left with 3 bottles: 2 are gifts and the other one will probably be in our fridge for a year...at least! Coming to East Tennessee for a visit and looking for some "off the beaten path" places to explore? 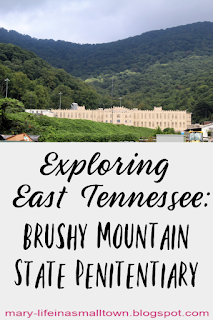 You'll want to check out the posts in my Exploring East Tennessee series. Oh, and check back from time to time...we'll do more exploring (which means more posts!). If you found this post interesting, check out the series that a local tv station aired. Interested in visiting? Click here for information. Even though he is dead, seeing the headlines for when Jame Earl Ray escaped still gives me chills. Read about it here. I think this is a great use of the old prison. Thank you for sharing it with us, Mary! Thank you, Suzanne! I don't know if I'll ever be brave enough to take the Paranormal tour. I think the idea is genius & a great way to help out the community! Looks like a really fun and educational tourist spot. I'm glad the facility was repurposed in a way that supports the community. It was, Annie! They have a lot of big plans for the place. When it closed it impacted so much of the community; it's good to see community members being employed and being able to make a living. Good job with the review, and thanks for sharing your experience. Very interesting! I'll have to tell hubby about this.